This DVD is a lot like that Tiny Tim sob story at the end of it – lame and propped up by only one good leg. It is ironic then that Tiny Tim’s segment in this, another gimpy attempt by Disney to trick you into making a holiday donation to their coffers, is the best part of this lump of video coal. Despite that, it’s easy to say that it isn’t nearly the Christmas disaster that their previous snow job, Mickey’s Once Upon A Christmas, was since this time they manage to include some material that wasn’t generated by their “straight to video” division. Specifically, you’ve got one short from the fifties featuring Pluto and Mickey Mouse and then you have the A Christmas Carol featurette they did in the early eighties. These two segments are the highlight of the disc, but it’s questionable as to whether their thirty or so minutes of material justify purchasing this. This particular night at the House of Mouse (Mickey’s nightclub) is Christmas Eve. We arrive just as they’re finishing up for the evening and everyone is preparing to go home, presumably for Christmas. I say presumably because of the make up of the crowd. The House of Mouse is one of these multicultural clubs where characters from all the past Disney animated films gather to relax. You can see the Beauty And The Beast crowd, the Cinderella crowd, the Mad Hatter, and the likes of Eyeore there. I even saw Pete’s Dragon! Old Man Winter though has gone and snowed everybody in at the House of Mouse and you know what that means! Time for an all-night show of shows with a distinctly Christmas theme! 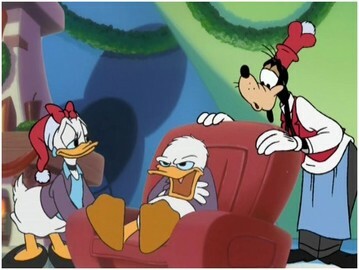 Aside from everyone being snowed in and forced to sit through these things (I’m guessing most of them were pretty wasted by the middle of the first segment – I know I was), you have the story line of Donald being all “bah humbug” about the holidays and his best buddy Mickey trying to give him some holiday cheer by torturing him with these stories. And in fact, Donald (and his three nephews) were the subjects of the first little bit involving the building of a snowman and some problems Donald had ice skating. Crudely animated and indifferently scripted, this tale immediately lost my interest as it became evident that it would merely be one of these cartoons where the characters would get chased around a lot. The next segment, Pluto’s Christmas Tree is instantly recognizable as coming from an earlier time when some effort was put into the backgrounds of the drawings and the characters looked like they actually had some depth to them and the colors didn’t seem as garish. To be fair, this cartoon is basically one where Pluto just chased Chip and Dale around Mickey’s Christmas tree. There is actually some imagination here though with bits like a chimpmunk hiding as one of the Santa candles on Mickey’s mantle and Mickey trying to light him up. Following that is a version of The Nutcracker with Mickey, Donald, and Goofy and it goes on too long and features Donald in mouse ears and buck teeth as the bad guy, making him look Count Duckla. It’s narrated by John Cleese and they try to go for that “too cool for school” bit where the narrator is a smart aleck who interacts with the characters, but it isn’t terribly smart and certainly isn’t funny. 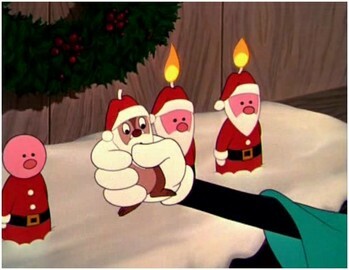 Finally they get to the meat of this thing and pull out Mickey’s Christmas Carol. Released back in 1983 along with The Rescuers re-release, it ended up being nominated for an Oscar in the Best Animated Short category. Also making appearances are Donald, Goofy, Daisy, Minnie, Jiminy Cricket, Uncle Scrooge, and even the evil Pete! This is a pretty quick and dirty retelling of Dickens’ story and its twenty five or so minutes go by really fast. The animation looks good, there’s actually a story, all-star cast, and no horrible musical numbers to mar the Christmas action. A definite winner. 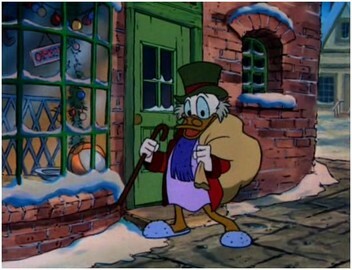 Once Scrooge gets finished becoming warm and fuzzy, we make one more unwelcome trip back to the House of Mouse and everything is wrapped up with one of the worst sugary songs about the season or giving or friendship or whatever that I’ve ever had the displeasure to endure. 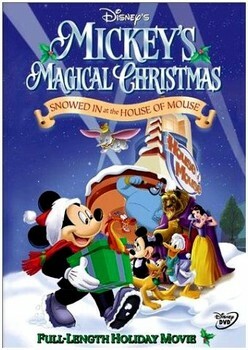 Obviously, your enjoyment of Mickey’s Magical Christmas will depend on your tolerance for the parts that stink, but if you’re just interested in seeing Mickey’s Christmas Carol, your best bet is to hunt down one of the later DVD releases or recent Blu-Ray edition.